Soft Gel Manufacturing - Zaxis Inc.
Modern Soft Gel Manufacturing is an incredibly long, sophisticated process, which relies on many of the electro-mechanical and chemical technologies. 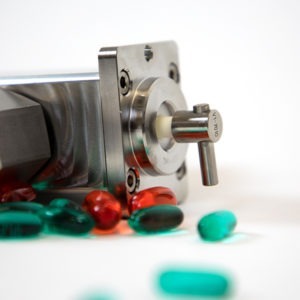 For many years, the encapsulation and filling of the active pharmaceutical ingredients (API), relied on old mechanical technologies, that no longer can keep up with the industry demands. The Zaxis eVmP pump has been the choice to replace mechanical filling methods, with a dynamic, electronically controlled, positive displacement, ceramic piston pump. In addition to being very accurate, the patented eVmP pump relies on the repeatability of sapphire hard, ceramic internals, and no valves. These wetted path parts are designed for millions of maintenance free cycles, because they resist wear. The repeatability and accuracy are very important in the control of API fluids, but the eVmP offered much, much more. The Sanitary Pump Head design is made of 316SS, and is easily disassembled for cleaning, which can take place after each batch or run of product. Once cleaned, an eVmP pump head must return to the encapsulation area quickly, and without compromise to precious downtime. With the modular design and electronic controls, including Ethernet IP, the pump is quickly getting back to another formulation and production run. Zaxis eVmP pumps can be configured in single OEM or Dual modules, including IP45, 316SS enclosures. For the latest in API dispensing technology, used in soft gel encapsulation, please come see us at Booth 1365 at Interphex, in NYC, April 2-4, where you can see the eVmP in action and talk to one of our application engineers.